Tinder, the swipe-for-matches dating app owned by IAC's The Match Group, is acquiring the startup behind the popular communication app Knock Knock. The San Francisco-based startup, called Humin was founded by serial entrepreneur Ankur Jain and David Wyler in 2012. 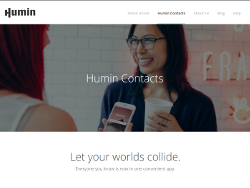 Humin's first product was a platform for managing contacts. Later the company launched Knock Knock, a stand-alone app that offers users options to connect with nearby individuals when they tap twice on their phone. It’s not hard to see why Tinder would be interested in a company that fosters in-person interactions. Tinder has now inked a deal to acquire Humin's intellectual property, technology, and team (though Jain has given his employees the option to stay or leave). Jain will join Tinder as vice president of product, while Wyler will become the company's vice president of partnerships. "It's clear that the team deeply believes in our vision and future plans," said Tinder's co-founder and CEO, Sean Rad, in a release. "We're excited to leverage their experience and IP to accelerate our product roadmap along with some other exciting projects we have in the works." "What gets me stoked is that this [acquisition by Tinder] gives us the ability to do what we can do at scale," Jain said. "Dating is just one piece of Tinder's mission and vision." The acquisition was likely in the works for some time. Tinder was in the market for an acquisition and Humin was struggling to raise further capital. Rad and Jain, who have known each other for years, finally discussed the possibility of joining forces last autumn. "We talked about our visions for connecting people in the real world, and the challenges there we could solve," Jain told Inc. "It was kind of a shock, but he said 'we should think about an acquisition.'" Exactly how Tinder plans to use Humin's technology is unclear, but speculation has been made that Humin’s background in contact management and location-based functionality will be used to evolve Tinder beyond the dating space. The app hopes to become a service with a broader mission of introducing people in real life, whether or not romance is in the cards. Whatever the future holds, Jain is excited about it. "Tinder is on the cusp of massive growth because it's just starting to embrace the breadth of its mission of helping people meet and connect in the real world," he told Mashable. For more on the Tinder dating app please read our review.